It’s no secret that “Justice League” is a movie that underwent a lot of changes during its production — credited director Zack Snyder exited the movie early this year and Joss Whedon oversaw reshoots that went on for so long that Henry Cavill had to shoot a bunch of scenes as Superman with a mustache that he grew for another movie. And the changes were so obviously massive that some fans, after seeing it, are demanding that Warner Bros release Snyder’s cut for comparison. Watching “Justice League” with the idea in mind that Whedon probably rejiggered the plot significantly is illuminating, if you know what to look for. There are definitely remnants of Zack Snyder’s vision all over the thing, some of which come into even clearer view after revisiting “Batman v Superman,” which I did this week after seeing “Justice League,” and also taking a look at the scenes from the trailers that didn’t make it into the movie. So I think at this point, we’re more than able to look at all these pieces and figure out what Snyder was going for before Whedon took the reins. Let’s start by taking a look at several items that I believe are key Snyder leftovers. -The opening credits montage, in which the world is in moral disarray because Superman died. The rest of the movie does not play on that theme at all, and there’s no complementary montage of people being good again now that Superman has been resurrected. That tells me that such a montage was never put together, which is important. -Similarly, an early action sequence in which Wonder Woman foils a plot by reactionary white suicide bomber terrorists to blow up a large chunk of London in hopes of triggering a new Dark Age. Their ideology seems very important, given that the movie actually takes the time to have them explain it, but whatever was going on there is never followed up. -Pretty much everything with Steppenwolf. At one point he screams “For Darkseid!” Another time he mentions that he’s trying to take the Earth in order to “end my exile,” indicating he is not simply operating on his own. But when the story of Steppenwolf is presented in a lengthy flashback sequence, the narration presents Steppenwolf as acting purely out of greed — he just goes around to various planets and uses the Mother Boxes to turn them into visions of his crappy homeworld, just because he likes doing it. Likewise, Steppenwolf regularly teleports to various places on Earth using some kind of energy tube that seemingly leads to space — but the movie gives no indication of where those tubes lead, and none of the characters even bother to wonder about it. And in the comics, the flying parademons who show up all over “Justice League” work for Darkseid, not Steppenwolf. -When the League resurrects Superman. This whole thing probably went very differently originally. None of them consider the possibility that using the Mother Box would draw Steppenwolf to them, even though it’s extremely obvious to the audience that it would do just that because that’s a storytelling cliche — and when he does come for the box, it’s so slight a moment that it had to have been a recontextualization of the entire resurrection sequence. There’s a bit from one of the trailers that didn’t make the final cut in which Cyborg, near the alien ship in Metropolis in which they bring Superman back, protects a police officer from an exploding tank that’s flying toward him. The whole Superman resurrection, in which he briefly acts aggressively toward the League before being calmed by Lois, appears to have gone very differently in Snyder’s version. -Relatedly, the March trailer shows one of the Mother Boxes as just sitting in the corner of Cyborg’s apartment that he shares with his dad. 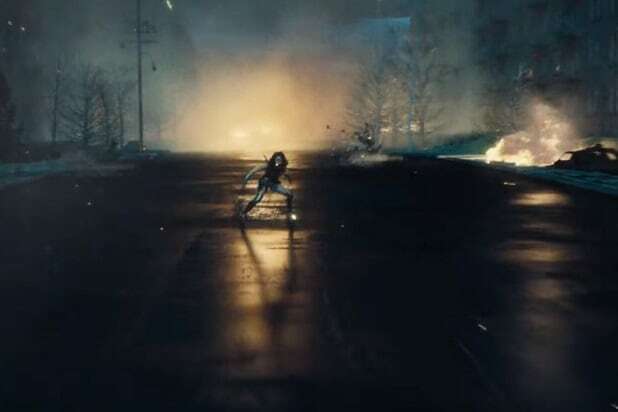 The trailer presents a shot of the box waking up during the scene in the movie where a parademon kidnaps Cyborg’s dad. That of course could have been a deceptive cut (trailers for movies of all types regularly feature unrelated scenes cut together), but even so, the finished movie never shows that the Mother Box is just in their apartment. To the contrary, Cyborg acts like it’s safely hidden away in some other secret location. That could explain why when the box is used in the finished film to resurrect Superman, Cyborg shows up with no explanation for where it was — given the patchwork weirdness around Superman’s resurrection and the seemingly related deleted scene I discussed in my previous point, this is compelling evidence that the Mother Box was not used in Superman’s resurrection. Given that the parademon actually does break into Cyborg’s apartment and kidnap his dad in search of the box, I’m inclined to believe that scene originally went how the trailer presents it. -It’s also important to note that the scenes in which Superman’s mouth has that CGI weirdness going on are not scenes that Snyder filmed, because he did not participate in the reshoots. The key scene, story-wise, is the part in which he and Lois are hanging out in the field near the Kent farmhouse immediately after his resurrection. That bit being something they filmed in reshoots is further evidence that Superman’s resurrection was supposed to go very differently. -Lastly, there are items in “Batman v Superman” clearly intended to set up a very specific plot thread that never came to be — and those items are not referenced in “Justice League” at all. I’m talking about Bruce Wayne’s nightmare of an apocalyptic future in which Superman is evil, and the subsequent visit from what seems to be a time-traveling Flash warning Bruce about what Superman will become should Lois Lane be killed. Bruce’s nightmare, or Knightmare, shows a ravaged landscape covered in parademons, those winged baddies who are the main foes for the Justice League in “Justice League.” There’s also another type of foe shown, however: what appear to be human soldiers fighting alongside the parademons whose armor is adorned with Superman’s logo. There’s a shot in one of the “Justice League” trailers which didn’t make the final cut, in which the Flash fights what looks like one of those human soldiers — but in the finished version of “Justice League” there are no human enemies, just Steppenwolf and the winged parademons. What those items add up to, in my mind, is a plot that is far less straightforward than the one in the finished film, which focuses far more on Superman. Here’s what I’m thinking: In the early going of “Justice League,” Steppenwolf was not yet a factor, and instead the main plot thrust revolved around a quest to bring Superman back. 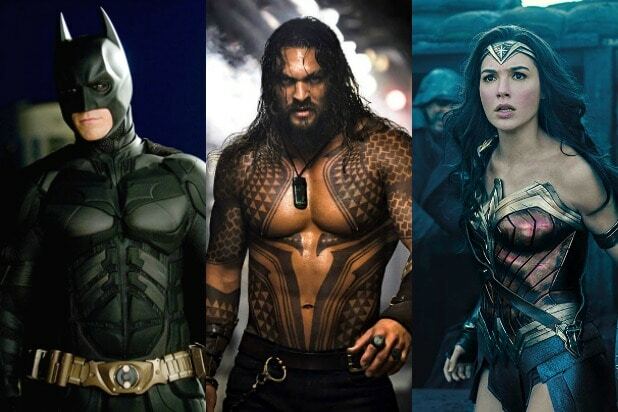 Batman and friends do know some kind of cosmic horror is on the way — that’s pretty firmly established at the end of “Batman v Superman.” But instead of the movie starting with said horror already on Earth, Batman and Wonder Woman are simply trying to prepare for it. So they set out to assemble a team — another thing set up in “Batman v Superman — and at least some of that order of events is the same as in the finished movie as it was in Snyder’s version, considering that we saw some of those same recruitment scenes way back in the 2016 Comic-Con trailer. Bruce demonstrates a weird lack of urgency when he meets with Aquaman and the Flash in the movie, even though the final version of the story features a very compressed timeline. They literally have just a couple days to deal with Steppenwolf before he brings the apocalypse, but you certainly would never guess, given how casual Bruce’s pitch was to them. So they at some point assemble the team and resurrect Superman inside the Kryptonian scout ship in Metropolis by some means –the Mother Box may not have been necessary given that the Kryptonians used that pool of amniotic fluid to make babies. After they bring Superman back, he goes crazy in the same way he does in the finished film, but his fight against the Justice League goes on much longer and doesn’t end with him reverting to normal. The government even gets involved, bringing tanks into the fight that Superman of course easily handles. However it ends, Superman does not go visit Kansas with Lois afterward, because that scene in the movie was a reshoot addition. It would be a very Snyder-esque payoff to the the themes set up in the early goings — the idea that Superman was a beacon who gave the people of Earth a moral center, and whose death threw everyone into disarray. They bring him back but he no longer functions as that beacon of goodness, which in turn makes the moral situation on Earth that much murkier. It would make sense, too, that even an angry Superman would amass followers willing to fight, for him as we saw in Batman’s nightmare. The timing of Steppenwolf’s move to the forefront of the plot is uncertain as I see it. If the League had to use Cyborg’s Mother Box to bring back Superman, then Steppenwolf would have probably made his big arrival afterward, possibly at the conclusion of the fight against Superman in Metropolis. If the Mother Box wasn’t used in the resurrection, then figuring out Steppenwolf’s timing is tough. Also Read: 'Justice League': What The Hell Is the Deal With Steppenwolf's Mother Boxes? But the start of Steppenwolf’s contribution to the plot of “Justice League” isn’t as important as what he’s doing and what happens to him — and the deal with Steppenwolf was pretty common knowledge before Whedon reworked the plot. First and foremost there: Steppenwolf is not working for his own gain, but is instead operating on the behalf of Darkseid, one of DC Comics’ biggest baddies. Darkseid himself wouldn’t have shown up in this movie, or if he did it would have been a quick appearance right at the end. You’ll recall that the plan was for “Justice League” to be two movies, with the one we just watched being Part 1. Darkseid would have been the villain in Part 2. 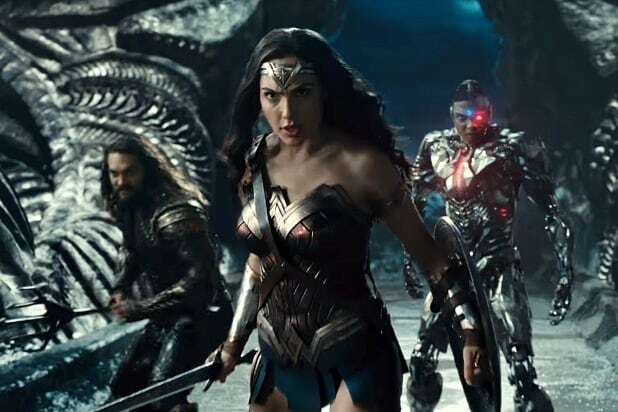 The finished movie, though, is not setting up Darkseid’s arrival in Part 2 because Part 2 is no longer on the schedule — and the current plan for the next hypothetical “Justice League” movie is for the League to battle a coalition of Earth-based supervillains. The lone surviving mention of Darkseid is pretty curious, then, because it doesn’t make any sense in the context of the movie as it exists now. It’s either an oversight, or just left in because Darkseid definitely will show up in the DCEU at some point, so long as they keep it going. Either way, knowing that Steppenwolf was just supposed to function as setup for Darkseid’s arrival in “Justice League Part 2” is important to figuring out the rest of what was changed in the finished movie. Specifically, how the final battle is different. There’s a couple parts to this so let’s get going. -Here’s the same shot from two different trailers. The first is from this year’s Comic-Con trailer, and the second is from the “Heroes” trailer released in October. And here’s the reworked version of the shot from the more recent trailer that ended up being how it looked in the movie. At first I assumed that Warner Bros and Whedon had simply changed up the color palette of the final battle — there are several other shots that are in both of those trailers with the same palette swap, and of course in the finished movie they stuck with the red hue. But then I noticed that the trailer that was released for this year’s Comic-Con contains shots from the final battle that are inconsistent — a couple have the old, black palette, and some have the new red palette. And even that very recent Heroes trailer has at least one final battle shot with the old palette. That March trailer and this year’s Comic-Con trailer features shots of an entire key location that didn’t make the cut — a place that looks like it could be a spaceship. We see Wonder Woman, Cyborg and Aquaman pop up in that space with the below hero shot that is also conspicuously absent. 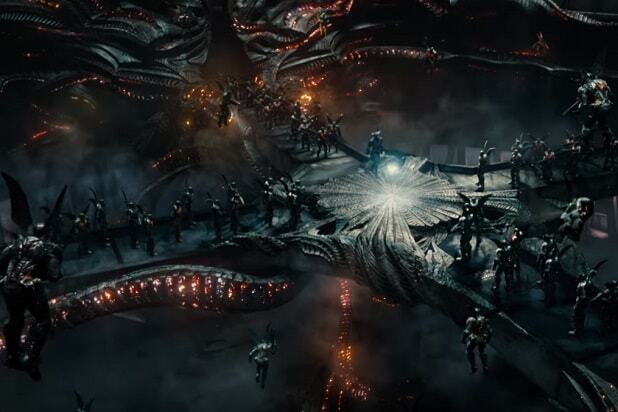 This is obviously some kind of bad guy lair, given that it’s full of parademons. In the center there you can see Steppenwolf and a glowing object that I’d bet was the combined Mother Boxes. 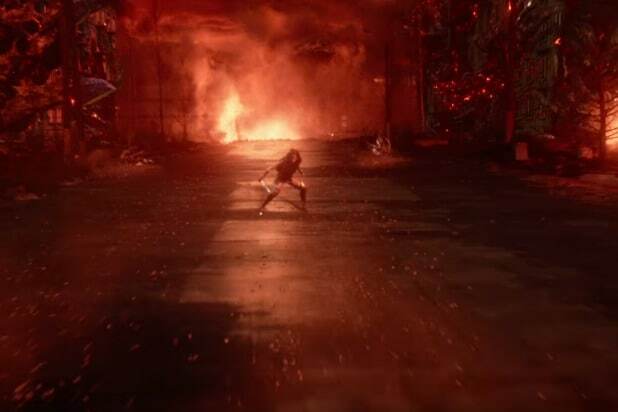 Though the environment is very different from Steppenwolf’s reactor base, the layout, with that X-shaped platform, is very similar to the room in which Steppenwolf sets up the Mother Boxes in the finished movie. It would make sense for this to be the place from which Steppenwolf keeps flying down to Earth through those transport tubes. All of which leads me to believe the location of the climactic throwdown was changed — given that Steppenwolf is from space it would make sense for the climax to happen on a spaceship — with the location of the climax moved from space to the surface of the Earth via the magic of CGI and color correction. The League being on a spaceship at the end of the movie would make it easy for them to learn about Darkseid. It’s also possible that the battle in the Russian city in the finished movie was a separate fight from the final battle, though it’s not even remotely clear what other context that battle could have taken place in. Despite this article being way too long, there are still lots of holes to fill in — the big one being that I have no idea what Superman’s role was supposed to be after his resurrection, and whether he would stay weird through the end of Part 1 or if that whole thing would have been resolved before the credits rolled. Given that a rogue Superman would have all sorts of ramifications for the other DCEU movie planned for the time between Parts 1 and 2, I’d think if he hadn’t been fixed by the end of this movie that he would have been out of the picture somehow during that intervening period. Unless, of course, all those other movies were going to take place before this one. That would be a weird choice, but this movieverse has been so haphazardly constructed that it seems entirely possible that was the plan. Either way, I hope this helped you out if you were as confused with what the hell was going on in “Justice League” as I initially was. Though it’s almost certain the version of the movie that Zack Snyder was making will never see the light of day, it’s still fun to dive deep into what could have been. 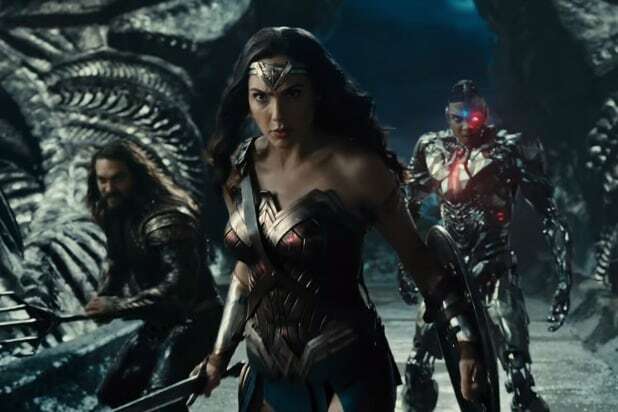 ‘Justice League': What The Hell Is the Deal With Steppenwolf’s Mother Boxes?